Encore Panther Island will be a thoughtfully designed luxury apartment community with direct access to the first segment of Riverwalk on the island. (Fort Worth, Texas) October 20, 2016 – Encore Multi-Family, LLC, a subsidiary of the Dallas-based Encore Enterprises, Inc., is officially under contract to break ground on the first private development on Panther Island. The thoughtfully designed 233,198 square-foot multi-family community will feature creative solutions to connect the streetscape to the Riverwalk environment planned for the district. Residents will be able to enjoy exceptional amenities including waterfront balconies, an infinity pool with cascading waterfalls, a state-of-the-art fitness facility and a top floor lounge that will feature the most dynamic views of downtown. Located at the intersection of 4th Street and North Main Street, residents at the 300-unit community will be walking distance to Panther Island Brewing, Coyote Drive-In, and Panther Island Pavilion. The community will be situated along the first segment of a series of interconnected canals that will wind throughout the island. This portion of the canal has been designed to accommodate a stop for the water taxis that are expected to serve the island. In addition, it will be accessible for those wanting to launch kayaks, canoes, and stand up paddle boards. “As the first development within the district we have carefully designed our project to fully integrate into this special high-density mixed-use district. We are dedicated to creating a special pedestrian-focused experience that allows our residents to walk out their front door and walk along the canal to enjoy the boardwalk along Fort Worth’s future town lake,” said Bharat Sangani, Chairman of Encore Enterprises. The design of the buildings celebrates Fort Worth’s rich connection to the railroad and takes cues from the historic railroad bridge trusses located throughout the city. The iron features throughout the design will be carefully balanced with extensive landscaping featuring a multitude of trees and native plantings. This community will be the first development to break ground within the Panther Island District – a vibrant waterfront mixed-use development located in the heart of Fort Worth. The more than 10,000 residences planned and 12 miles of active urban waterfront – including flowing canals and corridors that create uniquely-walkable spaces – will give rise to new businesses, trendy restaurants, and a booming nightlife. 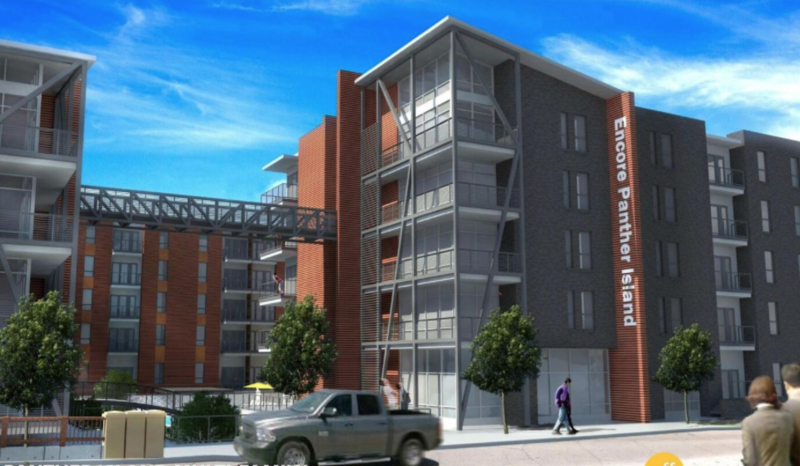 Construction for Encore Panther Island is slated to begin Summer 2017. Encore Multi-Family anticipates a grand opening date of Summer 2018. Encore Multi-Family, LLC is a subsidiary of Encore Enterprises, Inc. and was founded in 2008 as a fully integrated multi-family developer, owner and operator. The company is involved in all aspects of multifamily development projects and acquisitions including ground-up developments, joint ventures and mixed-use turn key developments. For more information about Encore Multi-Family, LLC, visit encore.bz or call (214) 259-7000.